Biggar ﻿Club brought their season to an end in fine style with local lad Tom Orr and his band. Work had taken Tom up to A﻿berdeen for a few years but he is now back at Hyndfordbridge and working as a Structural Engineer on oil platform construction at Rosyth. Accompanying him were Marie Fielding on fiddle, Craig Paton on keyboard and Gordon Smith on drums. Together they gave us an excellent traditional programme, with a very modern slant, which was enjoyed by everyone. Tom in turn complimented the wealth of local talent who turned out to support the Club and in particular local teacher, Keith Dickson, who is responsible for most of them. Local players were accordionists Janet Graham, Davy Millar, Fraser Hewitt, Charlie Todd, Ronnie Johnstone, Fin Hope (second time), Rose Cursiter, Samantha and Andrew Erskine, Emma Dickson, India Smith, Kyra Smith, Kyle Rowan, Adin Graham, Adam Gibb, Allan Smith, Jim Gold, John Weaks and David Kennedy as well as a group from the Scots Music Group in Edinburgh namely Bill Wallace, Liz Hall, Gordon Stewart, Billy Higgins, Rachel Frith, Ed Murray and Angus Creech. On fiddle were Hannah Dickson and Tom Gold and on penny whistle Willie Little. Providing backing on keyboard we had Jim Gold, Alan Rowan, Alan Gardiner, Keith Dickson and Jim Nichol. Drummers were Tom Hope, Geordie Shiels, Andrew Gibb, Ali McIntyre, James Dickson and the irrepressible Andrew Barrie. At the end of another successful season (in fact our 40th – with a “birthday celebration” planned for the November 2014 meeting) Chairman Alan Gardiner thanked all the people who made it possible including the Biggar Bowling Club (Alex and Nettie in particular), the KODA mums for providing the excellent buffet at every meeting, the listeners and the local players. We in turn thank Alan for all his hard work and look forward to Sunday 14th September when the Club restarts with another local lad, Andrew Gibb and his Broadcasting SDB. B﻿iggar held th﻿eir second last night of the season on Sunday, 9th March in the Biggar Bowling Club. Guest artistes were the Matthew MacLennan Trio from Edinburgh. Matthew, originally from Inverness with his very distinctive dialect, was accompanied on keyboard by Duncan Black and on drums by Gordon Smith. Collectively they gave us an excellent evening’s entertainment with a variety of tempos all beautifully played. 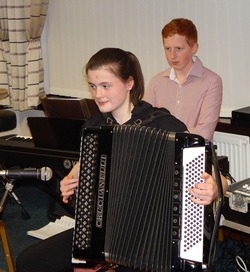 Local artistes in attendance were accordionists Fraser Hewitt, Rose Cursiter, Kyle Rowan, Andrew and Samantha Erskine, Emma Dickson, India and Kyra Smith, Andrew Philips (Kilwinning), David Graham (Ayr), Katie Todd, Davy Millar, Charlie Todd and John Weaks. On keyboard were Keith Dickson, Jim Gold, Alan Rowan, Adam Gibb and Alan Gardiner. On fiddle we had Tom Gold and Gilbert Logan, on concertina David Corner, on tin whistle William Little (Dumfries) and on drums James Dickson, Geordie Shiels and Tom Hope. Thanks once again to the Biggar Bowling Club for hosting us and to the KODA mums for the wonderful buffet. Our last meeting takes place on Sunday, 13th April starting at 7p.m. when local accordionist Tom Orr and his band will be our guests. We look forward to seeing you there. ﻿The Club met on Sunday, 9th February in the Biggar Bowling Club to be entertained by the James Coutts S.D.B. from Fife and a variety of talented local players. James was accompanied by Iain Cathcart on second box, Graham Berry on keyboard and Ian Adamson on drums. James showed us why he was Scottish Champion back in 1992 with two﻿ excellent spots interspersing his Scottish selections with Jack Emblow’s ‘Tango Musette’, Robert Adamson (of Cumnock’s) Triumph March and a quickstep and slow foxtrot. Immaculate playing all round and a great band sound. Local artistes supporting us were first timer Finlay Hope, Riddell Cairns, Fiona Sinclair, Charlie Todd, Jonathan Millar, Rose Cursiter, Alan and Samantha Erskine, Brian and India Smith, Emma Dickson, Katie Todd and Jim Gold. On keyboard were Shona Sinclair, Alan Gardiner, Keith Dickson and Adam Gibb. David Corner played his concertina and on drums were Tom Hope, Geordie Sheils and James Dickson. Once again thanks to the Bowling Club and to Sheena Dickson the KODA mums for the excellent buffet at half time. Sunday, 12th January, saw a full house at Biggar Bowling Club for our first meeting of the New Year. As guests we had local lass Emma Dickson from Dolphinton on accordion, with Adam Gibb from nearby Toftcombs Farm on keyboard. Emma, of course, is a member of one of the most musical families in Scotland with dad Keith teaching accordion and keyboard, mum Sheena playing accordion and keyboard, sister Hannah an up-and-coming fiddler and twin brother James playing the drums - all of whom were of course present as usual. Emma, herself a pupil of Wilson Wood of Whitburn, gave us a varied programme of Scottish, Continental and classical which kept the large audience captivated. She also showed tremendous confidence and ability of the microphone – great to see how these young musicians quickly develop their stage skills. New guest artistes often attract players and listeners from a wide area and this was definitely the case on the night. On accordions we had Fiona Sinclair, Riddell Cairns, Davy Millar, Rose Cursiter, Fraser Hewitt, Leonard Brown (2012 Perth Scottish Champion all the way from South Shiels), Andrew and Samantha Erskine, India Smith, Andrew Gibb, Claire Black, Adin Graham, Katie Todd and Kyle Rowan plus Keith Dickson’s entire Piano Accordion 3 class from the Scottish Music Group based in Edinburgh, namely Ed Murray, Hilary Kerr, Bill Wallace, Alistair McIntosh, Angus Creech, Rachel Frith, Pat Drewitt, Liz Hall, Elspeth Porter, Gordon Stewart and Iain Gotts. Time caught up with us and thanks to Janet Graham and Elizabeth Morrison for standing down. On fiddle were Jimmy Lothian, Tom Gold and Hannah Dickson and on concertina David Corner. Keyboard players were Alan Rowan, Shona Sinclair, Stevie Todd and Alan Gardiner and drummers Tom Hope, Geordie Shiels, James Dickson, Charlie Todd and the irrepressible Andrew Barrie. All in all quite a night. Once again thanks to the KODA mums for the half-time buffet and to all the raffle prize donors. At our December meeting at the usual venue, the Biggar Bowling Club, on Sunday, 8th Chairman Alan Gardiner welcomed a respectable turnout of audience and players on such a dreich night. On accordions we had Fraser Hewitt, Alan and Kyle Rowan, Marshall Harkness, Charlie Todd, Samantha and Andrew Erskine, Jim Gold, Kevin Gardiner, Emma Dickson and Adam Gibb. On fiddle was Tom Gold, on concertina David Corner, on keyboard Jim Gold, Keith Dickson and Alan Gardiner and on drums James Dickson, Tom Hope, Andrew Barrie and Geordie Shiels. Full marks to the many youngsters from KODA who come along every month and so ably entertain us and to the KODA mums who provide an excellent buffet at half time. Our guests artistes this time were Roddie Matthews and Friends, who on this occasion took the form of Gary Forrest on piano accordion, Robin Waitt on Shand Morino and Johnny Bridges on drums. All four showed themselves to be at the top of their game with Gary demonstrating some tremendous playing, Robin taking the unusual role of second box player on his button box, Johnny showing us what good drumming is all about and Roddie being his usual enthusiastic and proficient self on fiddle and in his role as compere. Appropriately the band had a distinctly Northumbrian slant to their selections but along the way there was something for everyone with Scottish waltzes, own compositions, an excellent rendering of Monte’s Czardas and a ‘hand knitted’ made-up-on-the-spot Christmas selection. Well done lads and thank you all for making the long journey to entertain us. 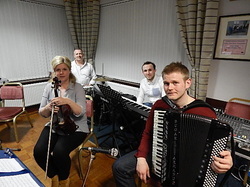 The club’s November meeting took place in the usual venue of Biggar Bowling Club and as guest artistes, we welcomed along the Clappy Doo Ceilidh Band from East Lothian. The band have a strong West Coast connection (with the Isle of Mull) hence the adoption of the curious band name (a Clappy Doo is a shell fish to be found off the West Coast). Band members Graeme Munro, Shauna Flockhart and Johnny Bridges treated us to a varied selection of traditional music including a number of own compositions from within the band and put on a great show for the assembled audience. Supporting players on the night were accordionists Janet Graham, Fiona Paul, David Millar, Fraser Hewitt, Rose Cursiter, Jim Gold, Alan Gardiner, Samatha Erskine, Andrew Erskine, Kyle Rowan, Emma Dickson, Adam Gibb, Katie Todd and David Kennedy with Hannah Dickson and Tom Gold performing on fiddle and David Corner on concertina. Playing piano were Keith Dickson, Emma Dickson, Jim Gold and Steven Todd with George Shiells, Tom Hope, James Dickson and Andrew Gibb keeping tempos in check on drums. Thanks once again to Biggar Bowling Club for the use of their premises and KODA mums who provided an excellent half time buffet. 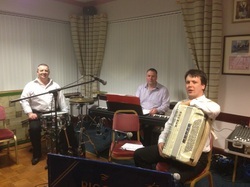 The Club opened the new season at our regular venue, the Biggar Bowling Club, in the company of the Ewan Galloway Trio. 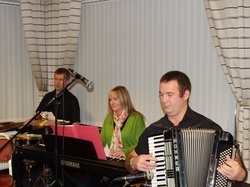 Lead accordionist Ewan hails from Coldingham and he was accompanied by Bill Ewan, from Markinch, on keyboard and Johnny Bridges from Haddington on drums. Local players for the evening were accordionists Janet Graham, Kyle Rowan, Claire Black, Charlie Todd, Alan Gardiner, Andrew and Samantha Erskine, Davie Miller, Emma Dickson, Jim Gold and Ian Graham with Tom Gold our only fiddler for the evening. Keyboard players were Fiona Paul, Alan Rowan, Keith Dickson and Jim Gold and drummers were George Shiels, Tom Hope and James Dickson. Shelley Clark, from Sanquhar, provided a welcome diversion with two beautifully rendered songs. As usual, many of our players are pupils of Keith Dickson, and he is once again to be congratulated on the high playing standards and entertainment value of the selections they played. It was great to hear old favourites like the Bluebell Polka and Heykens Serenade so ably played by the younger generation. Our guests provided us with a thoroughly enjoyable and entertaining programme of favourites, old and new, with something to suit all tastes. Ewan, playing a old Domino V with unusual ‘Belgian Bass’ recently acquired from France treated us to a balance programme of Scottish, Continental and modern selections. Bill Ewan showed his dexterity with a keyboard solo in Ragtime and Johnnie demonstrated an effortless mastery of the drums. Thanks once again to the KODA mums who provided an excellent half-time buffet and to the Bowling Club for the use of their premises.